A massive fire ravaged part of a Louisville, Kentucky industrial park on Friday. Eyewitnesses say parts of GE’s Appliance Park facility was consumed in the blaze, and local media reported that all employees are safe and accounted for. The fire broke out Friday morning within one of the buildings that composes the massive manufacturing plant opened in the 1950s by General Electric. Witnesses say that the blaze erupted inside Building 6 inside GE’s Appliance Park and that the building had collapsed entirely sometime before 8:30 a.m., according to WDRB News. By 10 a.m., NBC News was describing the blaze as a six-alarm fire. Building 6 was evacuated soon after the fire erupted, according to a local ABC News affiliate, and the network reported that it had “consumed the building,” sparing next to nothing. 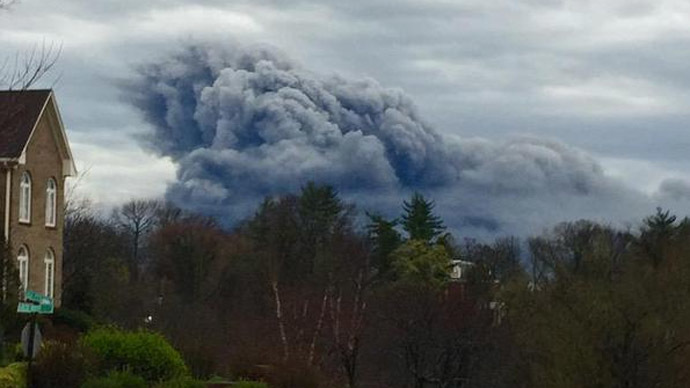 Nearby, witnesses reported seeing huge clouds of dark smoke and hearing explosions. As of 10 a.m., aerial footage captured by local network WAVE-TV showed dozens of firefighters attempting to control the blaze as huge black clouds continued to come from the building, and NBC reported that the smoke could be seen for miles. Building 6 is leased by Derby Industries, an industrial supply company, according to the ABC station, and a former GE employee told WDRB that the site was being used for storage. Authorities have not yet determined a cause of the fire, and a member of the Jefferson County Fire Service told NBC that more than 120 firefighters from 18 different districts throughout the region were on the scene as of 10 a.m. local time.